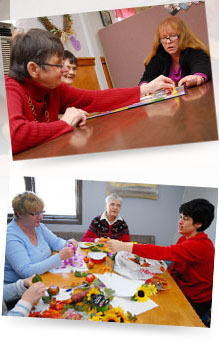 Horizon Achievement Centre recognizes and values the contributions of volunteers. If you have any of the following skills, we need you! Based on your level of expertise, opportunities in this area can range from teaching clients to independently play computer games that enhance cognitive, motor or communication skills, to teaching a more advanced level of word processing, database entry, desktop publishing or information technology. You could also volunteer on various Centre-based projects such as designing and producing newsletters, webpages and databases, etc. Are you experienced in food services, maintenance, trade or business? We encourage you to share this experience with others! Opportunities in these areas can range from helping clients to learn to cut vegetables, count or fold flyers, wash windows, etc., to a more advanced level of learning in preparation for employment such as making trays, setting tables, using industrial equipment, etc. Or help out with production demands, office work or Centre- based events! Do you have any hobbies like knitting, crafts or art? Can you play cards or play darts? Do you like music or play an instrument? Do you like sports such as walking, exercising, bowling, etc? Why not share this interest with others? We also need volunteers to help out with fundraising activities such as our annual Bowl-a-Rama or craft sales. Perhaps you have a new idea!